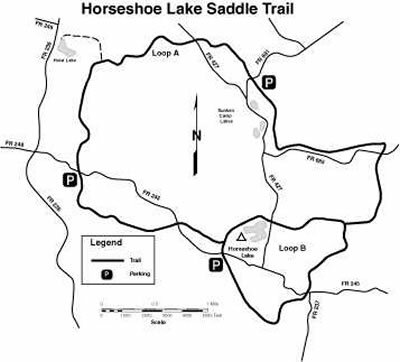 Whether you are looking for a pleasant afternoon ride or an extended visit, the Horseshoe Lake Saddle Trail is a perfect adventure for any horseback rider. Trail Length: A Loop 9.25 miles, B Loop 3.7 miles, Outside Loop 10.25 miles. What to expect: The terrain is gently rolling with a sandy loam surface ideal for horse riding. The trail weaves through towering pine and hardwood forests as well as through the area's open barrens. Whether you are interested in plants, scenery or wildlife, touring the trail with binoculars or camera can allow you to take advantage of fantastic viewing and photographic opportunities. The 11-site Horseshoe Lake Campground (see map) is specifically designed for horse use. Directions to Horseshoe Lake Saddle Trail: From Ashland drive west 14 miles on Highway 2 to Ino. Turn right (north) on FR 236 and drive 11 miles to FR 245. Turn right (east) and continue for 0.5 mile to the parking area and trailhead.